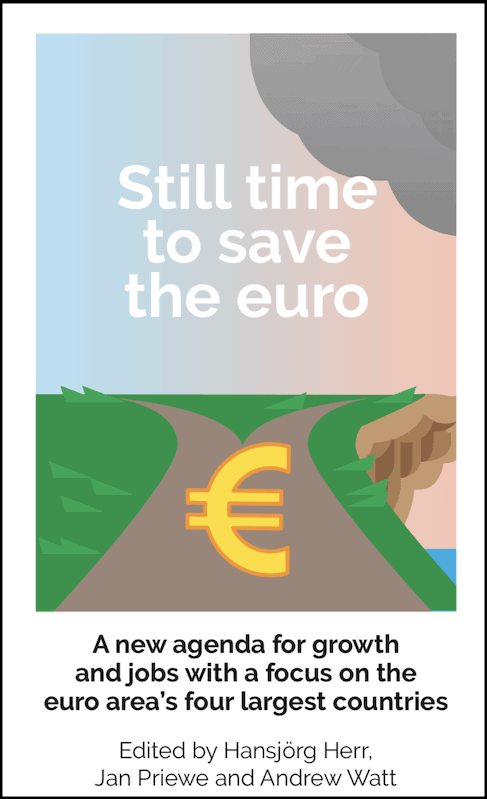 Twenty years after the birth of the euro, the outlook is more uncertain than ever. With a waning economic upswing, unresolved problems are returning to the fore. This book focuses, alongside the euro area as a whole, on the four largest euro area countries — Germany, France, Italy and Spain. They comprise 75 percent of the area’s gross domestic product (GDP) and their economic dynamic and stability have a strong influence on the other 15 EMU members. The divergence in economic perfor-mance after the financial crisis of 2008 among the “big four” is stun- ning. Italy’s performance is the most critical but all of them have deep structural problems, including Germany with its huge current account surplus. Economic, social and political cohesion within the countries and between them is at risk. Income inequality is on the rise. The upswing since 2014 must not be taken as a new normal. EMU countries are ill-prepared for stormy weather, whether reces-sion, financial crisis or political shocks. Despite considerable progress insome areas, the eurozone still requires fundamental reforms. The ECBcannot prevent rising interest rate spreads, so the risk of a fiscal crisisis ever-present. Fiscal policy rules need to be overhauled. External ac- counts of member states must be rebalanced. Unemployment has fallen but remains unacceptably high in many countries. The authors discuss proposals for monetary and fiscal policy reforms,sector policies, paired with a new institutional setting. It’s not the euro as such that is to blame for under-performance and growing divergences, but inherent faults in the design of rules, policies and institutions in EMU. The political stalemate regarding change must be overcome to make the euro a successful currency, with all member states better off in than staying out.